This week was filled with news of Congressional inquiries, subpoenas, and investigations, as House committee chairs took the first steps to hold Trump and his regime accountable. Leaks from the regime heightened concerns about a White House rapidly devolving to the Trump Organization, with Trump largely freelancing and acting unilaterally, and taking the advice from a small group of sycophantic insiders. With the government reopened, Trump delivered an otherwise mundane State of the Union speech, with the most memorable part being his attack on the investigations against him, evoking former President Richard Nixon’s 1974 speech shortly before impeachment proceedings began. Trump continued to push his manufactured crisis at the southern border, sending thousands more troops as he stoked racism and fear. Other than his State of the Union speech, Trump was relatively quiet in the public sphere this week, with fewer tweets and public comments than his recent more frenetic pace. In addition to the Congressional investigations being launched, more news of subpoenas and investigations of the Trump Organization and its properties surfaced, including the emoluments clause case and inquiries farmed out by the Mueller probe. WAPO reported in his 745 days in office, Trump has made 8,459 false or misleading claims. The most frequently repeated claims related to the Russian investigation, trade with China, tax cuts, and immigration. Morning Consult’s Trump Tracker found Trump had his worst monthly approval rating of his time in office in January, with a record-low 40% saying they approve, while 55% disapprove. Those who disapprove include 88% of Democrats and 56% of independents. A majority of voters in 27 states said they disapproved of Trump, while a majority in just 12 states saying they approved. A CNN poll found 7 in 10 say the federal government is doing a bad job of governing, including 43% who say this the worst job of governing in their lifetimes — double the share (21%) after the 1996 shutdown. On Saturday, Trump tapped Ronny Jackson to receive a promotion and become his top medical adviser, even though Jackson is still under investigation by the Pentagon after his derailed VA secretary nomination. It was unclear if the Senate Armed Services Committee would act on Jackson’s promotion nomination to become a two-star admiral while the investigations into mismanagement and misconduct are still ongoing. On Saturday, TIME reported several senior intelligence briefers broke two years of silence to warn that Trump is endangering American security with what they say is a stubborn disregard for their assessments. The briefers described Trump’s “willful ignorance,” as well as their attempts to keep his attention by using visual aids, shortening briefings points to two or three sentences, and repeating his name and title. Briefers said Trump reacts with anger when given information that contradicts positions he has taken or his beliefs. Officials were warned to avoid giving intelligence assessments that contradict his public stances. Trump has also ignored warning by intelligence on North Korea, including officials trying to get his attention by building a miniature version of a facility with New York’s Statue of Liberty to scale to show him the size. Trump said there is “very little ISIS and you have the caliphate almost knocked out,” adding “we’re at 99 percent now” — in stark contrast to Senate testimony by top U.S. Intelligence officials in Week 116. The rest of the interview aired before the Super Bowl. Trump said NFL ratings were now “terrific” because players were not kneeling and the league was not battling him. Ratings for the game hit a 10-year low. Trump said of the intelligence chiefs, “I have intel people, but that doesn’t mean I have to agree,” and cited intelligence failures leading up to the Iraq War. Trump typically gets just three intelligence briefings each week. The schedules revealed Trump spends his mornings in the residence, watching TV, reading the papers, and responding by phoning aides, Congressional allies, friends, regime officials, and informal advisers. Trump’s first meeting is typically at 11 or 11:30 a.m. Since midterms, he has spent 297 hours in Executive Time and 77 hours in meetings that included policy planning, legislative strategy, and video recordings. Axios reported the leak of Trump’s schedule left the White House rattled and set off internal finger-pointingand accusations of weaponizing Trump’s schedule. On Sunday, WAPO reported Trump is at a watershed moment of his time in office, facing a crossroads as Democrats take control of the House, and he finds himself at odds with intelligence officials and some GOP senators. White House aides describe a chaotic, freewheeling atmosphere reminiscent of Trump’s early weeks in office. Jared Kushner is acting as a de facto chief of staff as Trump remains unchecked and isolated. Mick Mulvaney, the acting chief of staff, has said he is trying to manage the staff but not Trump, and meets with Trump just twice a day. Trump is increasingly operating the White House like a family-owned business. On Monday, a Gallup poll found 60% of Americans oppose new construction on the border, up from 57% in June. The poll also found 81% support a path to citizenship for immigrants in the U.S. illegally. On Sunday, She’yaa Bin Abraham-Joseph, the rapper known as 21 Savage, was arrested by ICE “during a targeted operation with federal and local law enforcement partners.” An ICE spokesperson claimed he is a felon. In Virginia, Governor Ralph Northam said he had no plans to resign in the wake of a blackface scandal, while Lt. Gov Justin Fairfax faced two accusations of sexual assault, and AG Mark Herring admitted to wearing blackface at a party decades ago. On Thursday, GOP Rep. Steve King, who recently drew criticism for overt racism and xenophobia, reintroduced legislation that would make English the official language of the U.S.
Cindy McCain apologized after claiming she stopped a case of human trafficking at the Phoenix airport saying “something didn’t click.” Police found no evidence of wrongdoing, rather it was a mixed-race family. The NAACP Legal Defense Fund demanded an apology from a school district in Binghamton, New York, after AP reported that four 12-year-old female students said they were strip searched for drugs at school. On Wednesday, Virginia police sergeant Robert Stamm was suspended after being identified by an anti-fascist group as having an “affinity with white nationalist groups,” including tattoos, flags, and banners. On Thursday, by a 5-4 vote, the Supreme Court blocked Louisiana from enforcing a law that women’s advocacy groups said would leave only a single doctor legally allowed to perform abortions in the state. Chief Justice John Roberts, who has voiced concern about maintaining the integrity of the nation’s highest court after Kavanaugh’s confirmation process, voted with the court’s liberal members. Justice Kavanaugh filed a dissent, writing only for himself, saying he would have allowed the law to go into effect and see if it imposed a burden on women. WAPO reported despite allegations of ballot tampering in North Carolina’s 9th district, the Trump regime is focused instead on prosecution of non-citizens for alleged voter fraud. Twenty immigrants were rounded up in August 2018 over several days for illegally voting in 2016, one of the most aggressive voting-fraud crackdowns by a Trump-appointed prosecutor, Robert Higdon Jr.
Higdon also issued subpoenas for millions of records of foreign-born voters in August. All but one of the 20 arrested are legal residents, and just five defendants received minimal fines or mis­demeanor convictions. The crackdown in North Carolina comes as Trump and other Republicans attempt to portray illegal voting as a widespread phenomenon that threatens the integrity of American elections. On Monday, the ACLU and other civil rights groups sued Texas officials and five county elections administrators over an advisory urging counties to review the citizenship status of thousands of flagged voters. On Sunday, the Pentagon deployed an additional 3,750 troops to the southern border to help install wire barriers and monitor crossings, bringing the total number of active-duty troops there to around 6,000. On Tuesday, Gov. Michelle Lujan Grisham, the newly-elected Democratic governor of New Mexico, ordered the withdrawal of the majority of the state’s National Guard troops from the U.S.-Mexico border. On Wednesday, NBC News reported Customs and Border Protection officials in Eagle Pass, Texas will let in just 20 migrants per day, after a caravan of 1,800 arrived, a process referred to as metering. On Thursday, Commander Jonathan White, a senior Health and Human Services official, told a House oversight subcommittee he raised concerns about separating families before “zero tolerance” was announced. White’s concerns included the policy would be “inconsistent with our legal requirement to act in the best interest of the child” and expose them to unnecessary harm, and it would exceed the capacity of the program. On Monday, AP reported Belarusian model Anastasia Vashukevich, who had claimed to have information on ties between Russians and Trump’s campaign, said she has turned over the information to Oleg Deripaska. On Monday, BuzzFeed reported Rinat Akhmetshin, a Soviet military officer turned Washington lobbyist, received half a million dollars in suspicious payments before and after attending the June 9 Trump Tower meeting. Akhmetshin received a wire transfer of $100,000 from Denis Katsyv, owner of Prevezon Holdings, and $52,000 from a foundation funded by Katsyv and other wealthy Russians to try to undermine the Magnitsky Act. On Monday, ABC News reported prosecutors from the Southern District of New York public corruption section have subpoenaed documents from Trump’s inauguration committee. Prosecutors are seeking documents and records on the inauguration committee’s donors, and information on attendees at inauguration events including benefits to top-level donors. Prosecutors also subpoenaed the committee on its communications with California money-manager Imaad Zuberi and his company, Avenue Ventures. Zuberi is the only person named in the subpoena. Zuberi has largely donated to Democrats in the past, including Hillary Clinton and former President Obama. Records show Avenue Ventures donated $900,000 to the inaugural committee. The subpoena also requested records of vendors and contractors, including communications with payment-processing company Stripe. Jared Kushner’s brother Josh’s venture capital firm is a major investor in Stripe. On Friday, WNYC and ProPublica reported on evidence of potential tax law violations of self-dealing by Trump’s inaugural committee which spent at least $1.5 million at Trump Hotel DC around his inauguration. Evidence show that the nonprofit 58th Presidential Inaugural Committee paid $175,000 per day for event space, despite internal objections at the time that the rate was too high. Tom Barrack, the inauguration committee’s chair, also had a stake in Trump Hotel DC. Tax law prohibits nonprofits from paying inflated prices to entities owned by people who also control or influence its activities. On Monday, the Times of London reported prosecutors in Maryland have subpoenaed financial documents from the trust that owns the Trump Hotel DC and his golf resort in Turnberry, Scotland, in the emoluments case. Newsweek reported the Maryland attorney general has also subpoenaed Donald Jr., who is a trustee of the Trump Organization, and Allen Weisselberg, the organization’s financial officer. During his January 2018 testimony before the House Intelligence Committee, Glenn Simpson, co-founder of Fusion GPS, said Trump’s Scotland golf courses were used to funnel money from unknown sources. On Tuesday, NYT reported SDNY prosecutors are also investigating firms recruited by Paul Manafort over the flow of foreign money — another investigation spun off from the Mueller probe. The firms being investigated for payments to help improve the image of the Russia-aligned president of Ukraine include Mercury Public Affairs, the Podesta Group and Skadden, Arps, Slate, Meagher & Flom. On Tuesday, BuzzFeed reported on a cache of Trump Organization internal documents which reveal efforts to build Trump Tower Moscow was a long-running, detail-oriented undertaking. Documents show Michael Cohen and Felix Sater worked with Trump Organization lawyers and Ivanka to push forward negotiations while Trump was on the campaign trail, often praising Putin at key deal junctures. On Wednesday, CNN reported the Manhattan U.S. Attorney’s office is seeking interviews with executives from the Trump Organization. The specific inquiry and topics was not yet clear. The investigation is in addition to the cases against Cohen and investigation of the inaugural committee, andmay pose more threat to Trump, his family, and allies after the Mueller investigation and his time in office. On Wednesday, House Intelligence Committee chair Adam Schiff announced “in the interests of the investigation” Michael Cohen’s testimony scheduled for February 7 will be postponed to February 28. On Wednesday, a spokesperson for the special counsel said prosecutor Scott Meisler left the probe in December, but remains active in cases he is involved in — indicating the Mueller probe could be nearing its conclusion. On Wednesday, Paul Erickson, a GOP political operative and boyfriend of Maria Butina, was indicted in South Dakota on charges of wire fraud and money laundering — separate from the Mueller’s case against Butina. On Thursday, a federal judge in New York ordered the government to submit redacted search warrants on the Cohen raid in April, saying the redactions are necessary because “aspects” of the investigation continue. In keeping names confidential, federal prosecutors told the judge some individuals in the materials are cooperating, and others are subjects of the investigation into campaign finance crimes. On Monday, Politico reported Trump is expected to name Treasury Department official David Malpass to run the World Bank. Malpass has been a vocal critic of the bank, and is expected to rein in its work. Roll Call reported that the first Monday in the month of February was the legal deadline for submitting a president’s budget fiscal 2020 budget request to Congress. Trump ignored the law established in 1990. On Wednesday, the Miami Herald reported the DOJ opened an investigation into Secretary of Labor Alex Acosta’s role in negotiating a plea deal with Jeffrey Epstein over an accusation of molesting underage girls. The probe was opened at the request of GOP Sen. Ben Sasse. Epstein is known to have many powerful friends, including Trump, Bill Clinton, and lawyer Alan Dershowitz, who often defends Trump in the media. On Wednesday, the Trump regime announced it will roll back Obama-era restrictions requiring payday and vehicle title lenders to make an effort to find out whether borrowers could afford to pay them back before lending. The effort of rescinding the requirement on the lenders, whose lending practices are thought by many experts to be predatory, came as Mick Mulvaney took over as head of the Consumer Financial Protection Bureau. WAPO updated reporting to show T-Mobile executives seeking merger approval booked at least 52 nights at Trump Hotel DC. Sen. Elizabeth Warren and Rep. Pramila Jayapal issued letters demanding information. On Friday, ABC News reported Trump’s 2020 campaign has paid nearly $100,000 of donor money to law firm representing Jared Kushner, according to campaign finance records. Payments of $55,330 and $42,574 were made to Winston & Strawn, the firm Kushner attorney Abbe Lowell joined in May 2018. Contributions of $200 or less made up 98.5% of funds raised by the campaign last quarter. On Tuesday, 30 minutes before the State of the Union, the Trump campaign sent out a text message to supporters soliciting donations in exchange for having their name appear on a special livestream. Trump also told reporters “I hope I haven’t wounded Pocahontas too badly,” saying he would like to run against Sen. Warren, and said of Virginia Governor Ralph Northam, “he choked like a dog” at his press conference. Congresswomen wore white to Trump’s SOTU in 2017, and black in 2018 in solidarity with the #MeToo movement. But the sheer mass of 89 women in 2019 made a statement. Tiffany Trump also wore white. Trump delivered an hour and 21 minute SOTU, the third longest, in what was billed as a “unifying” speech, and billed as the theme “Choosing Greatness.” The speech was delayed due to the government shutdown. Trump’s speech was packed with false and misleading claims, and dubious figures related to the economy, trade, immigration, and foreign policy, many of which Trump has repeatedly used. Trump then added, “If there is going to be peace and legislation, there cannot be war and investigation. It just doesn’t work that way.” Democrats reacted with dismay and outrage. Republicans were subdued. Trump remarks echoed Richard Nixon in his 1974 SOTU: “I believe the time has come to bring that investigation and the other investigations of this matter to an end,” shortly before impeachment proceedings began. 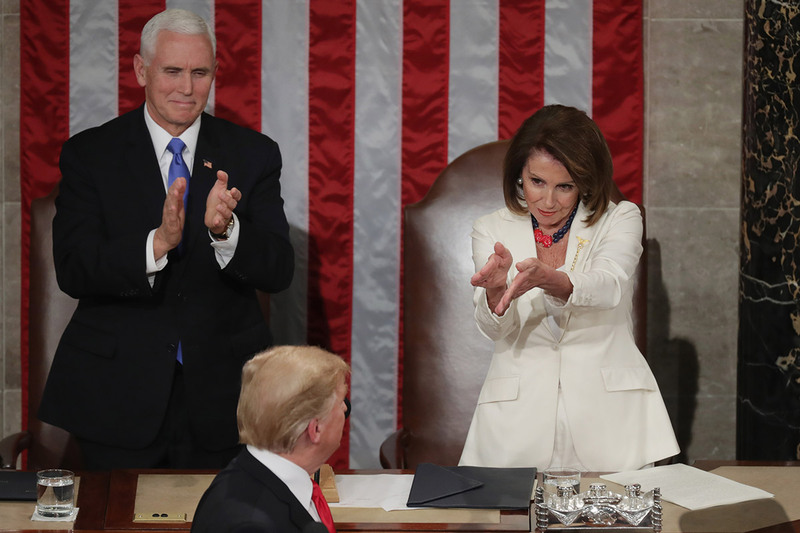 Pelosi also frequently checked the written copy of Trump’s speech as he spoke, and on two occasions calmed her caucus’ reaction by raising her hand. Democrats remained polite and disciplined throughout the speech. On Wednesday, in the first act under the leadership of Rep. Adam Schiff, the House Intelligence Committee voted to send Mueller unredacted transcripts of more than 50 witness interviews in the Russia probe. Democrats said the testimony will allow Mueller’ team to determine whether perjury charges are warranted, and include testimony of Steve Bannon, Hope Hicks, Corey Lewandowski, Donald Jr., and Jared Kushner. Schiff told reporters the committee’s work would expand to include any “foreign actors” who might have worked to influence Trump, his family or associates, or to impede any investigations. On Thursday, CNN reported Schiff has hired officials with experience at the National Security Council to help with oversight of the Trump regime. It is unclear if the officials worked for Trump, but the move enraged him. On Wednesday, Politico reported House Financial Services Chair Maxine Waters and Treasury Secretary Steve Mnuchin are in conversation about his testifying about lifting sanctions of Oleg Deripaska’s companies. Waters called for Mnuchin to testify after his department failed to turn over documents requested by Democrats by the deadline on Tuesday. Trump praised Second Lady Karen Pence, saying “she just went back to teaching art classes at a Christian school,” calling her a “terrific woman.” The school openly discriminates against LGBTQ students and staff. On Thursday, acting attorney general Matthew Whitaker said he would not appear before the House Judiciary Committee as scheduled Friday unless committee Democrats gave him assurances he would not be subpoenaed. In the early evening, chair Rep. Jerrold Nadler sent a letter to Whitaker, saying the committee would not make that promise and “there will be no need for a subpoena” if Whitaker answers lawmakers’ questions. After negotiations, Whitaker said he would appear on Friday, and Nadler agreed that no subpoena would be issued Thursday or Friday, after a day of back and forth public bickering between Democrats and the DOJ. On Thursday, a House Ways and Means Committee panel brought in several experts in tax law to begin hearings to lay the groundwork for a potential request to obtain Trump’s tax returns. The subcommittee discussed a provision which would compel presidential candidates to release 10 years of tax returns within 30 days of garnering their party’s nomination. Republicans oppose the measure. On Thursday, a CNN poll found that 87% of Americans believe Mueller’s investigators should release a full, public report — just 9% believe they should not. Republicans agree, with 80% calling for the release. On Thursday, CBS News reported Senate Intelligence Committee chair Richard Burr said two years in, its Russia investigation is broader, and perhaps more consequential, than people thought it would be. Burr also said because of access to intelligence product “we’ve interviewed people that I don’t even know if the special counsel knows about them,” and said their product will cover well beyond the 2016 election. Burr also said access “gave us tremendous insight to know when somebody was lying to us,” adding that the committee had “not been shy” in referring individuals for criminal prosecution. Burr said the committee is close to releasing a report on the Obama administration’s response to Russian interference, but that the rest could occupy the committee for decades, and much of it kept confidential. Trump also tweeted, “someday the Fake News Media will turn honest & report that Donald J. Trump was actually a GREAT Candidate,” and then tweeted a 50% approval rating by conservative pollster Rasmussen polls. On Thursday, NYT reported U.S. intelligence agencies intercepted a conversation of Saudi crown prince MBS telling a top aide in 2017 that he would use a “bullet” on journalist Jamal Khashoggi. On Thursday, a bipartisan group of senators introduced the Saudi Arabia Accountability and Yemen Act, which would impose sanctions on those responsible for Khashoggi’s death and prohibit the sale of some weapons. On Friday, CNN reported Trump refused to meet a legal requirement to send Congress a report due that day on whether crown prince MBS was responsible for the killing of Khashoggi. A spokesperson for the White House told CNN that Trump “maintains his discretion to decline to act on congressional committee requests when appropriate.” The refusal is likely to anger members of both parties. On Thursday, in a blog post on Medium, Amazon CEO Jeff Bezos accused American Media Inc, the publisher of the National Enquirer, of attempting to extort him over leaked naked photos. Bezos published AMI emails. Bezos’ blog post insinuates AMI, whose owner is Trump ally David Pecker, may have been politically motivated because of his ownership of WAPO, which had recapped AMI’s “catch and kill” practices. On Thursday, Ronan Farrow tweeted that he “and at least one other prominent journalist involved in breaking stories about the National Enquirer’s arrangement with Trump” received blackmail threats. On Friday, AMI said in a statement that it “acted lawfully in the reporting of the story” and “was in good faithnegotiations to resolve all matters with him,” but said it would thoroughly investigate the extortion claims. On Friday, AP reported federal prosecutors in the SDNY are investigating whether AMI violated an earlier cooperation agreement with its handling of the story on Bezos. On Friday, a White House spokesperson said he “wasn’t sure” if Trump was aware of the situation between Bezos and Pecker, adding he was “not aware” of the last time Trump spoke to Pecker. On Thursday, WAPO reported the government reopening is off to a rocky start as thousands of federal employees experienced delays or received incorrect amounts in their paychecks. The mood is described as subdued, with workers fatigued and demoralized. Private contractors have not been paid for invoices, and some had bureaucratic hurdles as contracts expired during the shutdown. On Friday, in a combative six-hour publicly televised hearing, acting attorney general Whitaker testifiedbefore the House in what likely will be his last appearance before William Barr is expected to be confirmed. Whitaker largely avoided answering questions, was an unsteady witness and often belligerent and rude to members of Congress, seeming to performing for an audience of one: Trump. Whitaker monitored the clock closely, at one point jabbing the committee chair Rep. Nadler, saying, “Mr. Chairman, I see that your five minutes is up,” resulting in gasps and laughs from the audience. Whitaker said he has not influenced the Mueller probe in any way, nor spoken to Trump about it since his appointment. Whitaker added he had not discussed the probe with other White House officials. He also refused to answer questions about whether he had approved investigative steps in the Mueller probe, and whether he had been briefed on the probe, and if so, how often. In an exchange with Rep. Madeleine Dean, Whitaker seemed to contradict himself on how he was notified by Trump of getting the job, saying it was by Trump’s tweet, then by a phone call, then said he could not recall. On Friday, House Veterans Affairs Committee Chair Mark Takano said his committee is opening an investigation of three member of Trump’s Mar-a-Lago who have had outsized influence in the Veterans Affairs. Takano requested documents from Ike Perlmutter, Bruce Moskowitz, and Marc Sherman, and their companies, of contacts with current or former VA officials. On Friday, Trump underwent his second annual physical while in office. Although this week he brought Ronny Jackson back to his staff, it was conducted by Dr. Sean Conley, a Navy officer. Details were sparse. Conley said Trump is in “very good health,” and that “reports and recommendations are being finalized,” but did not say when or if they would be publicly released. The physical was the only thing on Trump’s Friday schedule. When asked by reporters, a White House spokesperson did not explain why or how Trump was tweeting during his physical. On Friday, Trump confirmed a second summit with Kim Jong Un, tweeting, “my representatives have just left North Korea after a very productive meeting.” The summit will take place in Hanoi on February 27 and 28. Trump has continued to ignore and dispute evidence from experts and U.S. intelligence officials that North Korea’s compliance in talks is no more than smoke and mirrors, as their nuclear build-up continues. Vice President Mike Pence and Speaker Nancy Pelosi behind Trump at the State of the Union on February 5, 2019 in Washington, DC. After President Trump said “we must reject the politics of revenge, resistance, and retribution — and embrace the boundless potential of cooperation, compromise, and the common good,” Pelosi looked at Trump, he turned around, and she clapped in a sarcastic manner, which went viral.